South Asian Games multiple gold medallist Matthew Abeysinghe said he is delighted to gain Olympic qualifying standards and will make every effort to better his new mark at next month’s summer Games in Brazil. Abeysinghe, who became the first-ever Sri Lankan swimmer to reach qualifying standards in the history of Olympic Games, said his next aim is to improve further on his new personal best and make his presence felt at the XXXIst Olympic Games due to commence in Rio de Janeiro on August 5. 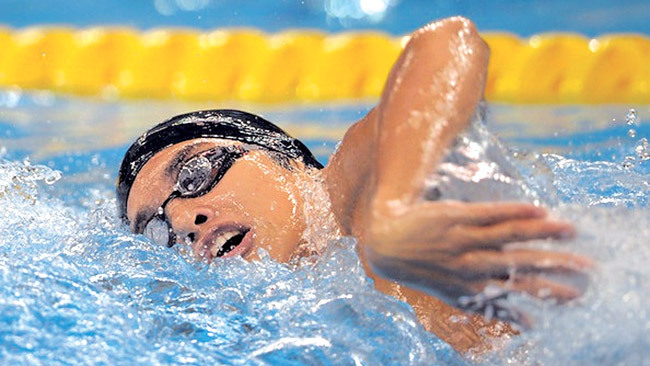 In a telephone interview with the Daily News from Hong Kong yesterday, the 20-year-old Lankan champion swimmer said he was looking forward to gain Olympic qualifying standard before the IOC deadline, although his name has been already included in the Sri Lanka contingent for the Rio 2016 Olympic Games as a wildcard entry. “I always wanted to make it to the Olympics by proving my ability, to achieve Olympic qualifying standards and go to Rio as a qualified athlete and not just as a wildcard entry. I have worked hard for this. I am happy that I could achieve my goal in the final meet before the Olympic qualification deadline,” said Abeysinghe who had won a record seven gold medals at the last South Asian Games in India early this year. Abeysinghe’s timing in Hong Kong was well inside the Olympic Games qualifying standards for men’s 100m freestyle – 0.17 seconds ahead. The IOC approved ‘B’ category qualifying timing for the event is 50.70 seconds. The Lankan swim sensation said his next target is to cut down his timing by around 0.5 seconds. “It will be my first Olympics and I am looking forward to make it a memorable one. My immediate goal is to better the personal best by about half a second,” a determined Abeysinghe said. He is due to return to Colombo today and would continue to train under his father Manoj Abeysinghe who has proven his class as a productive coach of international class. Besides Abeysinghe, three other Lankan athletes have reached Rio 2016 Olympic qualifying standards - Anuradha Indrajith Cooray (men’s marathon), Niluka Rajasekara (women’s marathon) and Sumeda Ranasinghe (men’s javelin throw).